American, they of the almost certain to be horribly botched proposed merger with USAir, announced recently that there was a brand new service initiative in place. For the uninitiated, new initiatives by American Airlines, are designed to appeal only to the uninitiated, because when American is implementing something new, the results can range from mildly annoying to full-on catastrophic. The new initiative only pertains to Business and First Class customers (oh, come on, you didn’t really think they were going to do anything to alleviate the misery and suffering of the Coach passengers did you?) 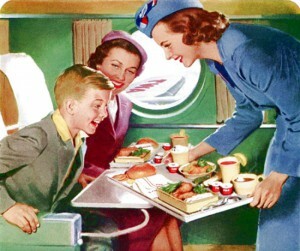 The folks in the front of the plane can now pre-order their meals before they fly. Real outside-the-box thinking there. Because, when I’m thinking about picking an airline I want the one that insures that no matter what, I can get that dried out chicken breast meal, instead of being stuck with the oily overcooked salmon. My expectations for an airline, at least in the US, are not all that high I think. The airline offers to transport me and a couple of pieces of luggage from one spot to another, preferably without smashing me and my fellow passengers into a field at close to nine-tenths the speed of sound. In return, I will give them cash, and obey all orders, no matter how silly, given by the airline, and the FAA, without question. Although, I reserve the right to refuse to moo in unison with my fellow passengers, if I feel like it. Granted, the food is still the same old stuff they’ve been serving since the dawn of time, or at least since the dawn of airline deregulation. I mean, in all the times I’ve been offered a meal on American the choices were either sadly overcooked pasta or chicken. Once in a while, when the chicken apparently fails to meet the appalling low standards of the catering company, they offer salmon instead. Since there isn’t a whole lot of flavor going on here, the choice is mainly esthetic – in what form would you like your protein? So far, reports from the field are not exactly encouraging. Most people report that the flight attendants haven’t heard a thing about the new program. The few who do encounter flight attendants who’re familiar with the program, say the FA’s didn’t receive a manifest with the relevant information. And in a few cases, the FA’s exhibited a reluctance to care whatsoever about it, as it’s just one more thing to keep track of, on top of all the other things they have to keep track of. So thumbs up all around American! Another brilliant coup that will rock the other airlines back on their heels. If airlines had heels, which I’m pretty sure they don’t.